Whilst we have not been to the Red Bull Ring for some 11 years, the track is very similar to the likes of the Hungaroring and Silverstone: a mixture of medium/high speed corners with a few heavy braking zones thrown in for good measure. It is therefore a circuit that requires slightly higher downforce levels and good driveability from the power unit due to the multitude of undulations. The track’s gradient, particularly in the traction areas, puts the a lot of lateral acceleration into the tyres which can easily cause them to overheat, hence the importance of a strong power unit. Force India introduced their most comprehensive update of the year so far, with the second stage set to come in for Silverstone in just over a week’s time. The changes were pretty widespread and predominantly aerodynamic. 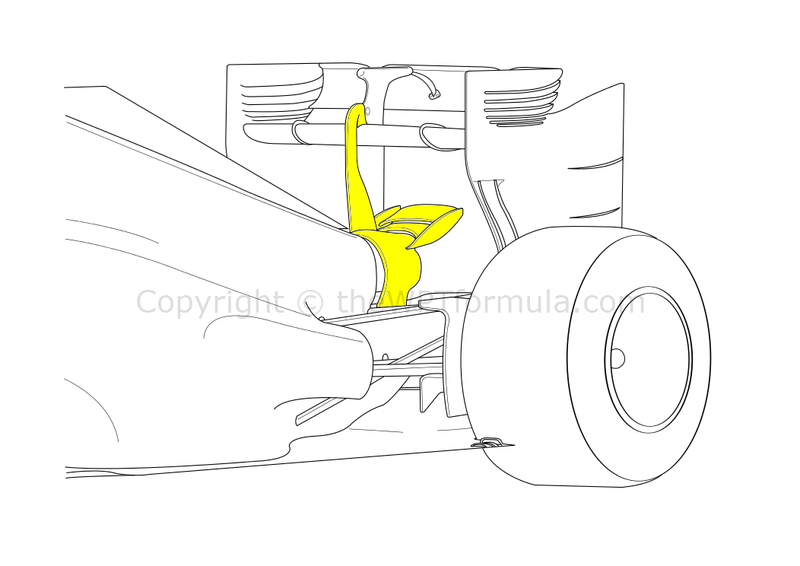 Numerous amendments were made around the leading edge of the sidepod, including these new wing mirror mounts. The mirrors used to be attached directly to the top of the monocoque but they are now placed further away by a dog-leg arrangement. 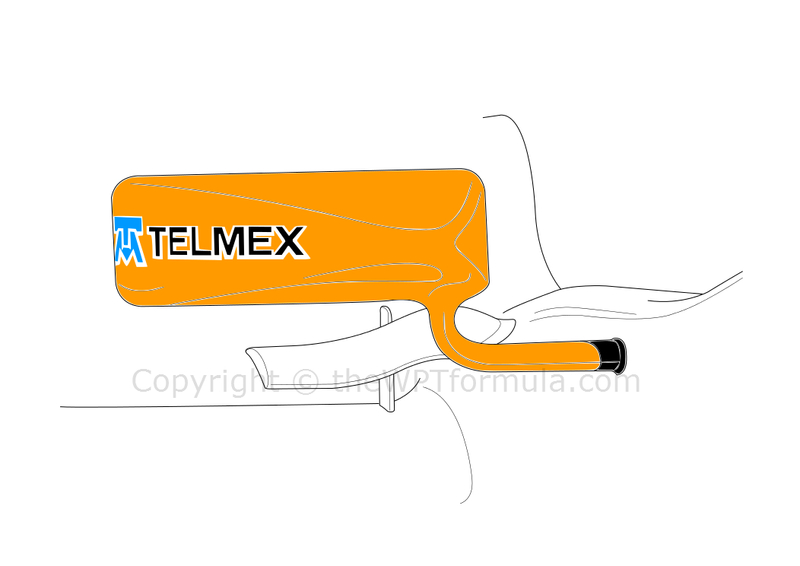 This will work in conjunction with the new horizontal extension to the sidepod’s vertical vane. The trailing edge of the vane now wraps over the shoulder of the sidepod to meet the cockpit side at 90 degrees, something that Ferrari and Lotus have already been utilising. Working with the mirror mounting, the airflow passing over the sidepod will be encouraged to flow downwards towards the top of the diffuser. The rear of the sidepods were also modified to a similar shape of those on the Red Bull, Mercedes and, more recently, Ferrari (see here). The large single outlet surrounding the exhaust is now gone in place of two single vents, one for each side. These exit above the diffuser rather than before the rear suspension components, increasing the efficiency of the undercut/Coke-bottle area of the car. Up front the VJM07 received a few tweaks to the front brake ducts, under-chassis turning vanes and nose. Whilst the shape of the nose itself is almost identical to its predecessor, the pylons have been completely overhauled. In years gone by we have seen teams slowly move the mounting of the pylon as far rearward of the front wing as possible. 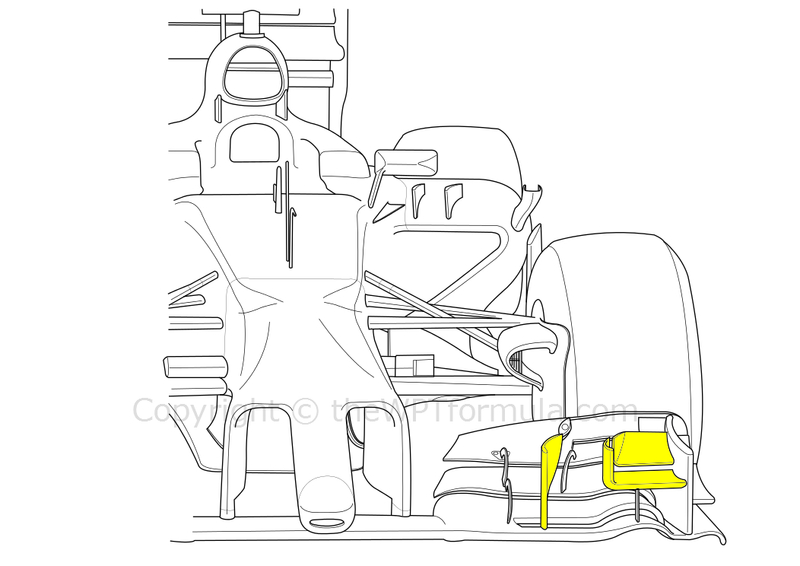 This allows the pylons to act as turning vanes ahead of the splitter which is vital for rear downforce when the airflow reaches the diffuser further back. Force India have decided to now do the opposite and move the pylons further forward. The new design arches much further forward but retains its curved trailing edge. The change will have been aimed at taking advantage of the air passing beneath the nose, forcing a slightly larger volume downwards towards the leading edge of the floor. This is an interesting design manoeuvre and one that we should keep an eye on as the season progresses. There was a sense of disappointment that the team couldn’t use the updates brought to Canada due to high temperatures, but modifications were made and they were used to full effect in Austria. These were coupled to small adjustments to already-existing components such as the swan-neck rear wing pylon introduced in Spain, removing the winglet element above the exhaust in favour of a small lip to entice the exhaust plume upwards. Austria represented the second stage of updates for the MP4-29 after a steady stream had made their way to the car since Spain. These changes, however, marked an overhaul change in aerodynamics around the front of the car and the team looked in much stronger shape as a result. 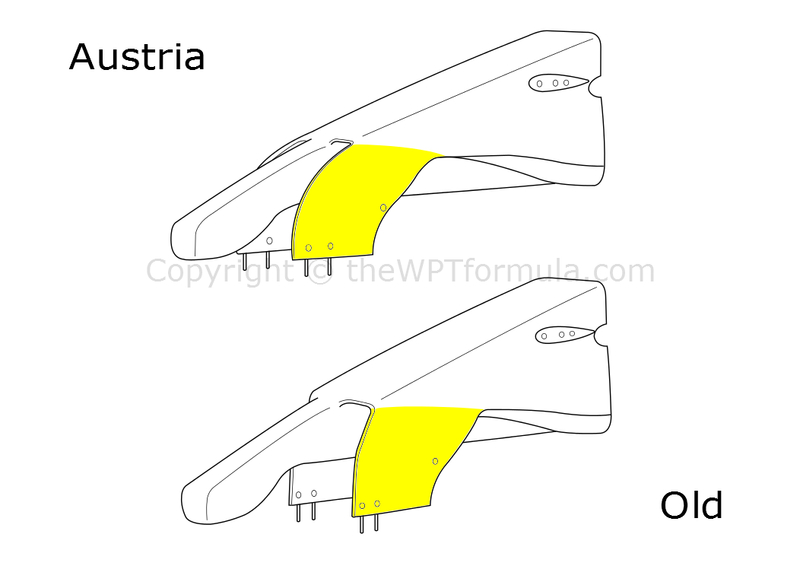 The most visual change of all was a new front wing, which departs from their long standing philosophy of using the maximum surface area available for the upper flaps. The flaps have now been thinned slightly and offer a more sinuous surface to the oncoming airflow. They wrap around the modified main plane which now features an arched trailing edge to induce a stronger vortex along the Y250 axis, shielding the leading edge of the floor and sidepod from troublesome tyre wake. Highlighted in the image above are the new cascade elements. The main winglet is much smaller than the outgoing model and no longer includes the small vane on top. 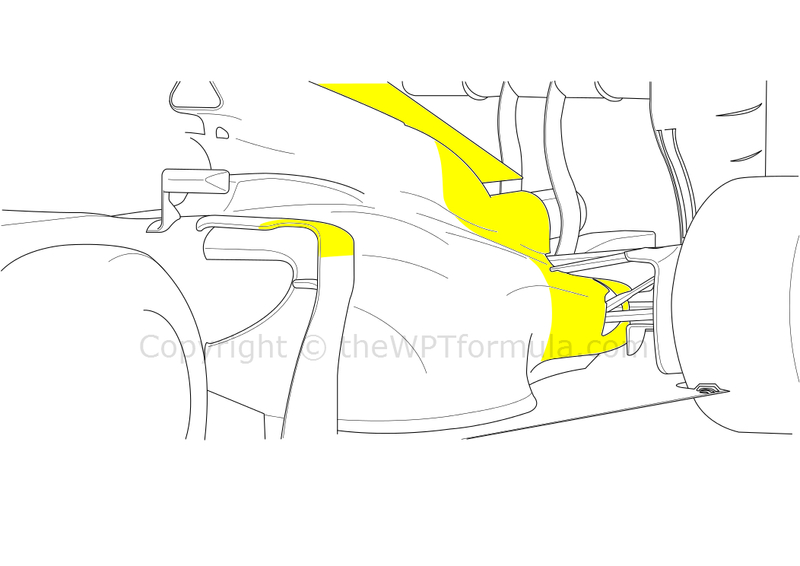 A larger vane, however, has been added alongside, much akin to that seen on the Mercedes. These alterations are designed to send airflow around the front tyre in a more efficient manner. The front brake ducts and under-chassis turning vanes immediately behind the wing have also been addressed to, working in conjunction with the changes made ahead. Finally, the rear diffuser now features a more squared off edge, increasing the volume and outwashing effect. Additionally, 5 pairs of vortex generators were added to the central section of the diffuser to encourage airflow to remain attached to the upper surfaces and produce more upwash. Red Bull have already been exploiting the use of such devices in this area already this year. Overall, it feels as if McLaren are slowly moving away from their traditional design philosophy and moving with the times. This was an important weekend for Red Bull and Toro Rosso and certainly the latter team produced, particularly through Daniil Kvyat who still qualified 7th despite losing DRS. Interestingly, Toro Rosso have approached their new front wing design where McLaren have departed it. 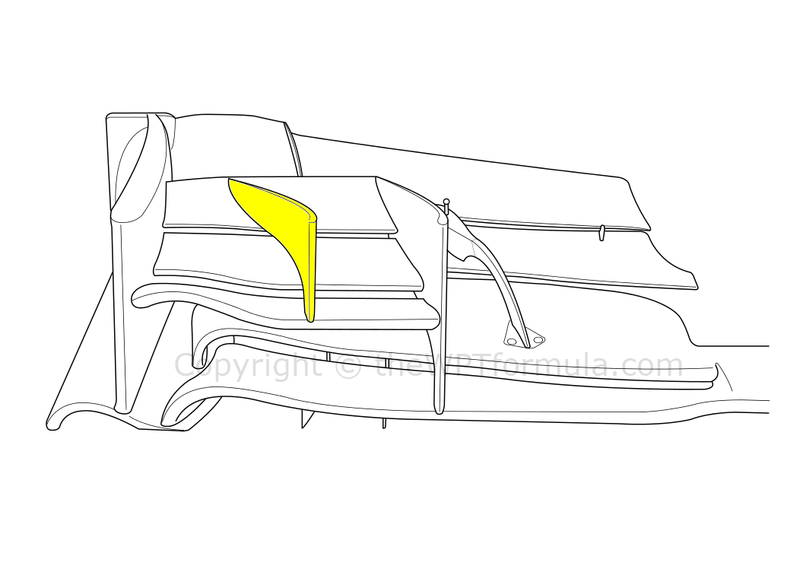 Offering a large surface area, peak downforce should be much better than the outgoing wing at a cost of consistency. The new, wider cascade winglet supports a small turning vane that generates small vortices heading around the front tyre. A small edge has been added to one of the upper flaps to condition the Y250 vortex produced by the main plane. The rear wing, sidepods and under-chassis turning vanes were also subject to change, the latter component following the latest trend of a 3 element design attached to a small footplate beneath.